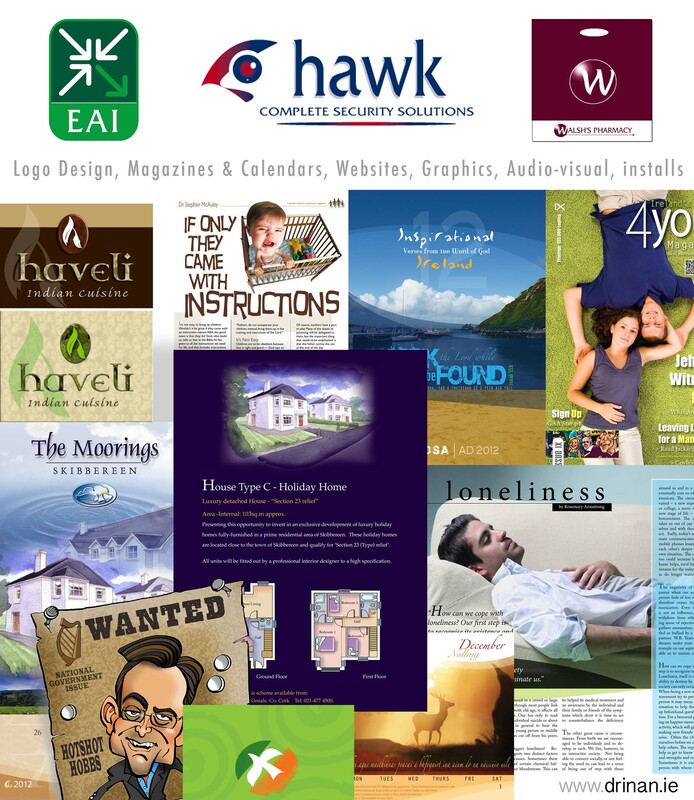 Drinan Arthouse has created & designed many corporate identities such as Walsh Pharmacy Group, Hawk Security, Haveli, EAI, Aontas Ireland, IBI, DORE Electrical and many more. Graphic Services include: Logo design, brochure design (printed & online), website design, manuals, concept to product design, audio-visual installations & animated graphics. 2007-2009: Designer of Cork Council Green Cycle Lanes Promotional Awareness Campaign with Eddie Hobbs. cork, ireland • tel: +353 (0)21 4374948 • Drinan Arthouse is the studio of Irish artist Peadar Drinan. Sculptural Commissions include The ‘Solar Ring’ Sculpture for GSK Company and “The Heron” Sculpture, Carrigaline. Well known oil paintings in naturalistic style include ‘The Quad, UCC’ and ‘Mr. Pederson - Novartis MD” Portrait. The 20ft long ‘Healing Hand Triptych’ found in the Chapel of Cork University Hospital is an example of Drinan's large semi-abstract, spiritual/inspirational painting. Drinan illustrations are a regular feature of the Irish Examiner newspaper. All contents on this web-site - © drinan arthouse - Todos los derechos reservados.